With it's modern contemporary looks the Professional Plus 100 range cooker offers a 5 zone Induction hob which is fast, responsive and incredibly controllable, offering the ultimate in speed and energy efficiency heating just the pan not the hob itself. Spillages won’t burn to the surface making cleaning exceptionally easy. The added safety measure of residual "hot hob" indicators makes induction a great choice for families. Rangemaster’s unique Preparation and Simmer settings for melting butter and chocolate, simmering vegetables or cooking pasta help to create perfect results every time. Boasting two generously sized electric fan ovens, the Professional Plus 100 can easily cater for a family, enabling the cooking of multiple dishes at the same time. The left-hand oven with the glass porthole door also has the innovative Handyrack which means no more burning your hands reaching in to the oven cavity to check your roast. It attaches to the main oven door and gently pulls the roasting tray out as you open the door and will support a roast weighing up to 5.5 kilos safely. The tall right hand fan oven with an 82 litre capacity is one of the biggest on the market. With four shelves it is perfect for batch baking or family pizza nights in addition to everyday use. The main left-hand oven has catalytic liners which reduces greatly the amount of cleaning required to just the base and door and the tall fan oven has an easy clean enamel coating. The Rangemaster Professional Plus also features the upgraded Glide-out grill gliding smoothly out on telescopic runners, making it easier to check on your food safely by eliminating the risk of pulling the grill pan out too far. The dual circuit electric grill has both full and half grill settings for both ease and economy. Available in a choice of colours there is a Rangemaster Professional Plus 100cm Induction Cooker which will look perfectly at home in any kitchen. Choose from stainless steel, black, cranberry or cream, all with a stylish chrome trim. 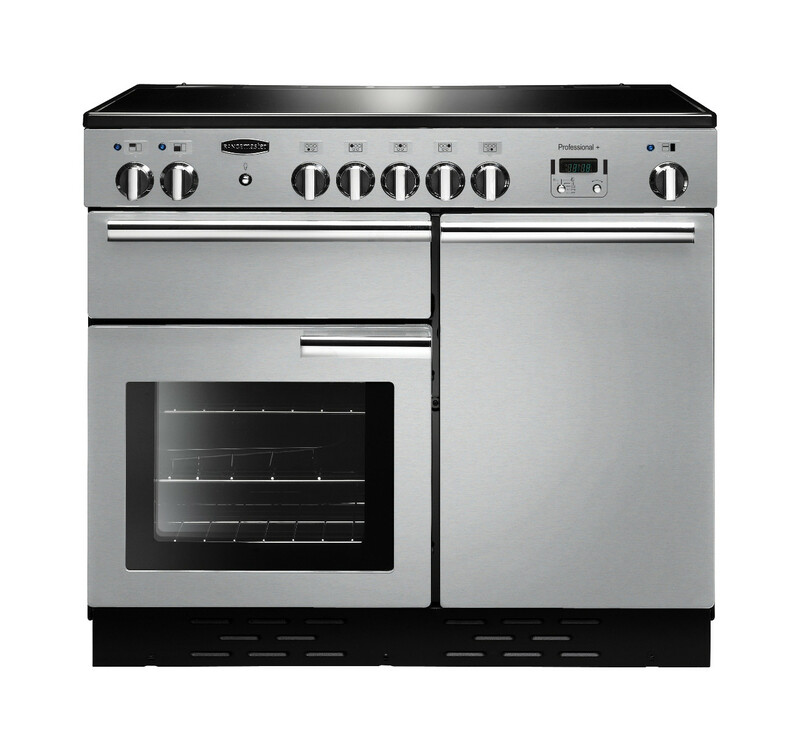 Also considering the Rangemaster Professional Deluxe? Find out the key differences between the Professional Plus and Professional Deluxe models on our blog.